You humans may remember that I’m the only four legged participant in the Giver Games, where we work to spread random acts of kindness. Each day, we are given a theme and we practice a random act of kindness based around those themes. I am honored to represent bengal cats and special needs cats for this contest! On Monday, the theme was DRAW, so I drew a montage of special needs cats and reminded people that these cats are just as loving and fun as any cat without special needs. Tuesday’s theme was GOLD, so I made my human make some sandwiches to give to the homeless so that he’d obey the golden rule of doing unto others as you would have them do to you. Yesterday, thanks to your help, I was able to figure out that the theme of the day was KID. That made it hard for me to figure out exactly what to do in order to perform a random act of kindness around a kid. I guess I could have given one of the kids in the new condo complex that I live in a head bonk and purr and paw tap, but that would mean my human would have to put me in my cage again. Like I was going to let that happen without a fight! But I thought about something. 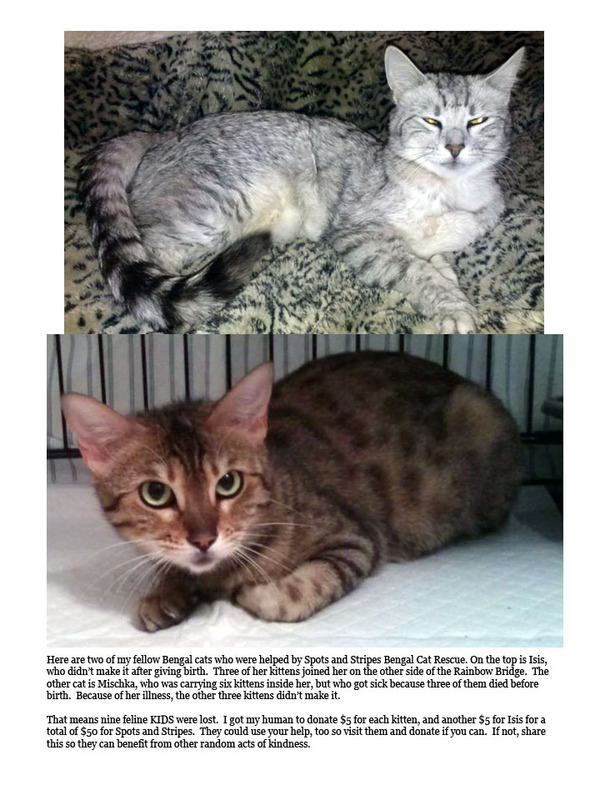 I told you the sad story about the bengal cat at Spots and Stripes Bengal Cat Rescue who had to go in for emergency treatment due to complications from her pregnancy. The story had a happy ending, as she was able to be treated, recover, and kind humans donated enough money to Spots and Stripes to get Mischka home. By the way, I see that five of you humans who read about Mischka went to the Spots and Stripes donation page. Purrs, happy meows, and friendly paw taps to you for doing that! Another pregnant bengal cat named Isis didn’t make it after her pregnancy, and three of her kittens went over the bridge with her. So I made my human donate $5 for each of the feline kids who didn’t make it plus another $5 for Isis to Spots and Stripes. I figure it’s the least he can do to help remember those feline kids, and to help Spots and Stripes spread more kindness. Normally, when I want my human to do something, I need to threaten him with biting. Not this time. He was very happy to give! Hi, Jason. Thank you for helping Spots and Stripes. I love it when humans are kind to us felines. I send you head bonks and happy meows!